Curry fans will love the loyalty card available from Green Chillies in Blackheath Road, Greenwich. 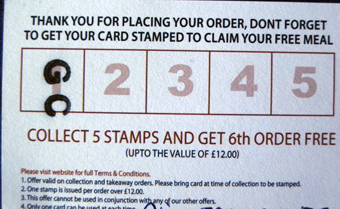 Spend £12 or more on a takeaway (collection or delivery), get your card stamped and enjoy your curry. Do this five times and the sixth curry (up to the value of £12) is free. Green Chillies, 110 Blackheath Road, SE10 8DA. Tel: 020 8469 1719. E-mail: info@greenchillies.com.